Glass has served a purpose for both style and function for hundreds of years. The earliest known production of glass was in 1226 in the United Kingdom, and glass has been used for decoration and useful function ever since. Antique glass is sought after by collectors for its history, style, colors and unique appearance. However, it can be difficult to distinguish antique glass patterns. There are a few tricks to make this easier. Look for clear, thick glass with edges that are polished to an angle that is not 90 degrees. The light is refracted through the glass, which creates prism-like effects. This is called beveled glass. Watch for glass pieces with a transparent, monochromatic glass that is usually colored. The surface can be either smooth or textured and is referred to as cathedral glass. Examine glass items for a surface that looks like alligator skin. This is crackle glass and is created by reheating and blowing the glass to create surface fissures and is a technique that dates back to early Venice. Look for glass that has a multi-colored surface that has a shimmering rainbow effect. Called iridescent glass, this also known as carnival glass, which was a popular Depression-era style. One of the most popular patterns in carnival glass was the stag and holly pattern, with a picture of a stag deer and holly leaves. This was manufactured by the Fenton Glass Company. Find glass pieces that are pink, blue, red, yellow and green, which are usually Depression glass items. Popular Depression glass patterns included bubbles, diamonds, hearts, lace and swirls. Collectors often refer to Depression glass patterns as “Adam to Windsor,” meaning that there are at least 23 patterns of Depression glass, which are usually referenced alphabetically. To view the full list of Depression glass patterns, find a reference book to see detailed photographs and information. One such example is “Mauzy's Depression Glass: A Photographic Reference with Prices” by Gene and Cathy Florence. Examine the glass items closely for hand-etched patterns, cutting wheel patterns and hand-ground bottoms, all of which identify Elegant glass patterns. 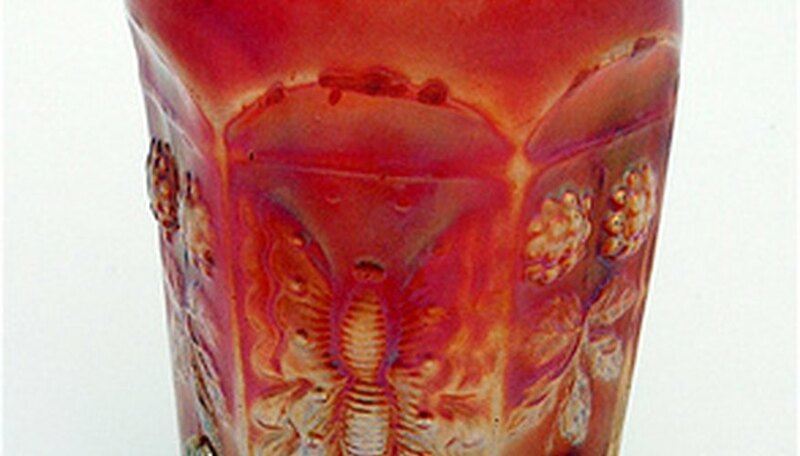 Elegant glass was produced during the Depression but was treated by hand after being removed from the mold, giving it a greater attention to detail and more intricate patterns. Identify glass that is milky or opaque in color, typically in a white or bluish shade. This is milk glass, which was popular during the 1800s and often had block and fan or button and arches patterns on the glass. Watch for glass that is yellow-green in appearance and looks slightly iridescent. This is Vaseline glass and is made by adding 2 percent uranium dioxide to the glass ingredients. Vaseline glass can be identified by shining a black light, or ultraviolet light, on the glass, which will glow florescent green.